Let’s say Gordon Ramsey went fishing, and got a huge salmon. With that salmon, he cooks a fish pie, but he wants it to be really good. He tirelessly works on it, getting the perfect pastry and the perfect vegatables to go with this perfect salmon. After slaving away, he serves it to you, and it looks delicious. You take a sniff, indulging in the beautiful smell, and take a bite. However, when your lips meet the food you find that this fish pie, through acts of freakish chance, tastes identical to a Cornish pasty from Greggs. You fly into a rage at this, your eyes snapping to Gordon Ramsey with murderous intent. Your fist tightens around your fork and you lunge at the Scotsman, the fork’s stainless steel prongs spearing his neck like a knife into butter. He collapses backwards, gurgling as the blood gushes out of his jugular, but you’re in too much of a frenzy to stop as you just keep stabbing. I suspect this is sort of why Absolutely Anything has been so viciously savaged by the critics. 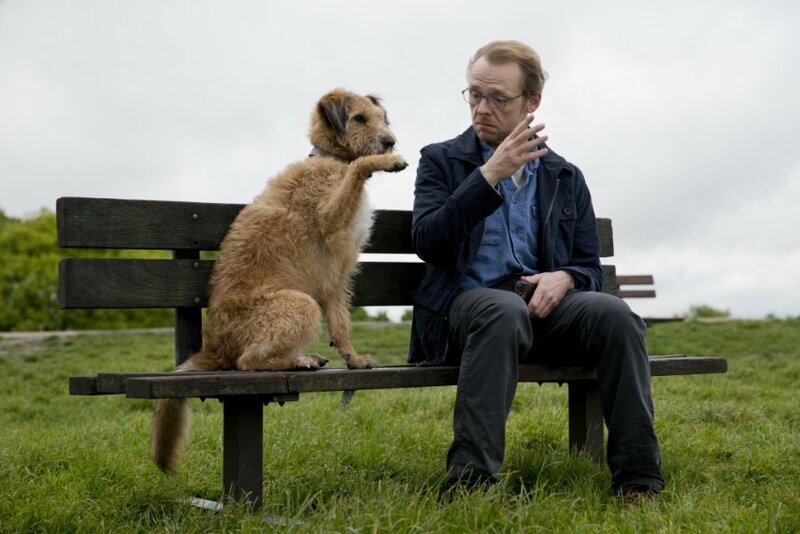 The pedigree is phenomenal; you have all of Monty Python on board, with Terry Jones directing and writing, you have Simon Pegg, possibly the most famous British comedian working in Hollywood right now, and to top it all off you have the last role Robin Williams voiced. And apparently all that can bring about is a film that’s pretty good, but not great. Suddenly, 5+5=7. Cats are giving birth to puppies. The chocolate kettle isn’t melting. The world flips upside down, and this film is to blame. It doesn’t even matter whether or not the film is bad, but it completely rocked your understanding of the laws of physics. You can’t put a Simon Pegg into a square hole. In my opinion, the bad write-up is not entirely deserved, because I laughed quite a bit and quite hard. The jokes mostly work, though it takes a while for it to get going. The biggest problem with the humour is that most of it is ‘pretty funny’ but light, and then very suddenly the film hits you with a black-as-gallows gut buster that makes the rest of the film look bad. You can see writers Jones and Scott trying to suppress their much darker and much funnier instincts in the name of not driving away the audience. It makes for a bizarrely tone-deaf film. The cinematography and soundtrack are ok; I’ve often felt those elements are at their best when you don’t notice them, and this is one such case. The plot is very smart, taking directions you don’t see coming and staying small when another film would’ve gone big and dumb, but this sometimes gets in the way of the actual comedy. 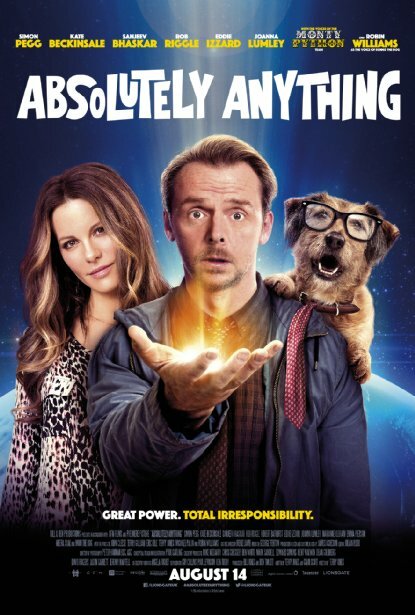 Just about the only consistently great part is the acting; Simon Pegg is a master of playing the relatable but ever so slightly mental slacker, and Robin Williams is great as his dog Dennis. The scene stealer, however, is Rob Riggle as a stalker and army general whose scenes are brilliant, but once again highlight the hidden darker nature trying to burst out of the otherwise twee film. Absolutely Anything is a victim of its own desires. It wants to be a silly, fun and harmless comedy for mum and dad to watch on the weekend, and it works. But there’s a dark edge struggling to show itself; some of the best jokes in the film come from subverting expectations with punchlines as mercilessly brutal as they are funny, particularly when Neil attempts to make the world a better place. Wholesome innocence is not the house that Monty Python built; anarchic silliness and vicious cruelty are their real strengths. This film needs what a man trying to eat steak with just his lips needs; a far sharper bite.